If your questions aren't answered here, please contact us and we'd be happy to help! 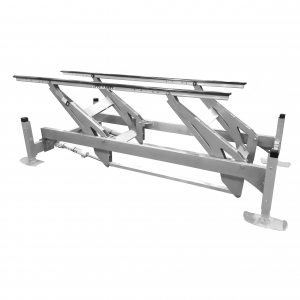 What is the minimum water depth required for an Undermount Lift? The rule of thumb is 8" plus the draft of your boat. What is the minimum water depth required for the Platform Lift? 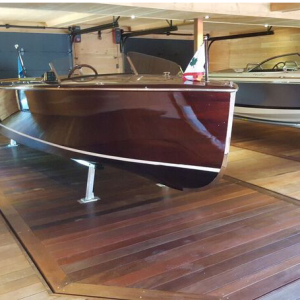 As a general rule, we require 17" + the draft of your boat for our Platform Lifts. Depending on your situation you may be able to get away with less depth. We will determine this at a site visit. What are the electrical requirements for your Platform and Undermount lifts? We use two different companies for our platfrom and undermount lifts and depending on your situation, we will suggest which lift to go with. No Profile lifts require 220V power supply. ShoreStation lifts are powered by FlexPower – a 24V system that is charged by a solar panel (no electricity needed) or a battery tender which requires 110V receptical. Your lifts look so clean and clutter free, where is the motor located? The boxes that house the motors themselves are powder coated alumninum and look nice on their own but we understand that preserving dock space and aesthetics are very important! We have a great deal of flexiblity in the location of the hydraulic box. The box can be located in a mechanical room, on a shelf, in a closet, in the past we have built bench's to fit over top to disguise them while giving them a function and we have even hidden them in the rafters, we are always up for suggestions! My dock / boathouse is on cribs, can the Undermount and Platform lifts be installed? Yes, they can be installed on cribs, however there are a few determining factors to ensure it is a good fit such as crib placement and the condition of cribs. A site visit is required to assess your situation. What happens if you are in an area prone to flooding? While the hydraulic lift tubes are installed above the water, they can be flooded out without issue. The only portion of the lift that shouldn't get wet is the motor and batteries. All of our systems are designed with quick disconnects to easily and quickly remove the motor and batteries in the case of rising waters. 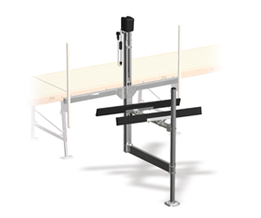 If you get flooding regularly, we can install the hydraulic box above the dock on a bench, shelf, or in the rafters so you don't have to worry! What maintenance is required for the Undermount & Platform lifts? One of the best features of ShoreStation's system is that it is virtually maintenance free. The only required maintenance is replacing your batteries, which is commonly 3-5 years and checking on the fluid levels annually. The hydraulic fluid should be replaced every 10 years with environmentally friendly fluid. If desired you can leave the batteries in all year round as long as they continue to get a charge from the solar panel or battery tender. Otherwise you may want to disconnect them and store indoors over the winter. With ShoreStation's lifts you don't have to worry about annual inspection costs, greasing gears, replacing or reparing cables, or removing and installing the lift yearly to avoid ice damage. What Kind of Hydraulic Fluid is used, and how often should I change it? All of our Hydraulic lifts use environmentally friendly Hydraulic fluid. Rarely will you experience a leak, but in the event that a leak does occur, the fluid is biodegradable and EPA approved. It is recommended to replace the hydraulic fluid every 10 years. ShoreStation broke the mold when it engineered its FlexPower® system, resulting in one of the fastest lifts on the market. DC battery power is the brawn behind FlexPower®, purposely chosen for its safety and superior performance over AC in marine environments. With FlexPower®, the battery acts as a buffer between the power supply and lift. Flexpower delivers maximum and constant power to the motor for fast lift times, ensuring years of trouble-free operation. FlexPower® also removes the worry of battery drain and maintenance. Choose from their totally automatic power supplies – solar or battery tender. These charging systems keep the battery at peak power taking the hassle out of battery maintenance. 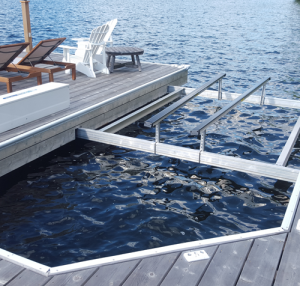 One of the great things about our Undermount and Platform lifts is that all of the components of the lifts are above water. In the unlikely event of having an issue with the cylinder, we can access the lift tubes while your boat is on the lift, year round, so there isn't an issue with servicing the lift. The hydraulic cylinders themselves have a 6 year warranty.